Kremlin in Pskov city on photos. Pskov is the center of Pskov region. Location, past, present. Pskov city. Kremlin on photos. 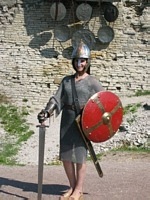 Pskov has jubilee, 1100 year, on July, 2003 year. All pictures was taken by Natalie during celebration time. Kremlin with Walls and Towers on photos. Kremlin with Trinity Cathedral and Belfry. Pskov city. Kremlin, north part. Trinity Cathedral in the Kremlin on photos. View from west side. Trinity Cathedral in the Kremlin on photos. View south-west side. Great photos of Trinity Cathedral in Pskov city. Dovmont Town. Prince Dovmont Timophey. The Administrative chamber in Dovmont's Town. Sword and shield in honor of Prince Alexander Nevsky and Victory over the Teutonic Knights at Chudskoye Lake in April 1242.